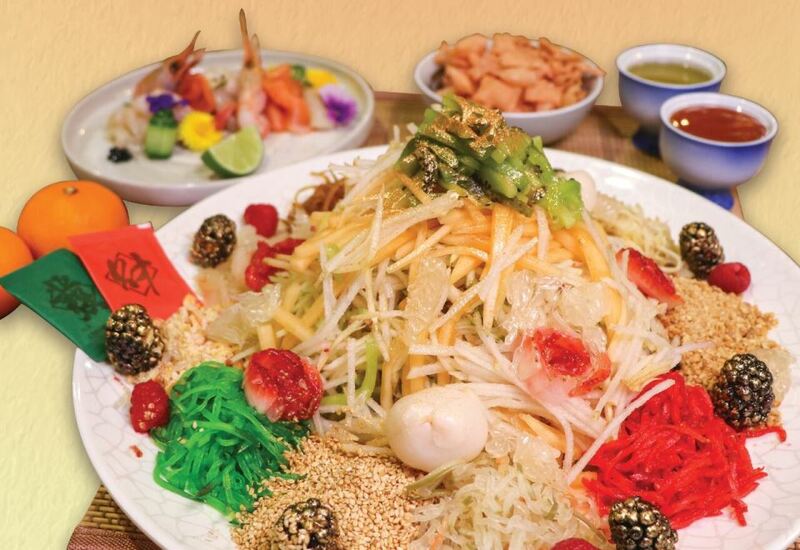 Chinese New Year is inching in on us, and every CNY is accompanied by the prosperity toss (a.k.a Lo Hei Yu Sheng 捞起鱼生)! Not sure where you're headed for Lo Hei this CNY? Or in need of more suggestions of where to get your Yu Sheng platters? The Lotus Vegetarian Prosperity Yusheng is a colourful abundance of over 30 ingredients. Featuring premium vegetarian salmon and fish slices made from konnyaku, as well as vegetarian ba kwa, lotus root slices, julienned apple and more, you definitely don’t want to toss this off the table. The Prosperity Vegetarian Salmon Yu Sheng and Prosperity Vegetarian Abalone starts from S$28++ and S$38++ for 2 to 4 pax respectively. 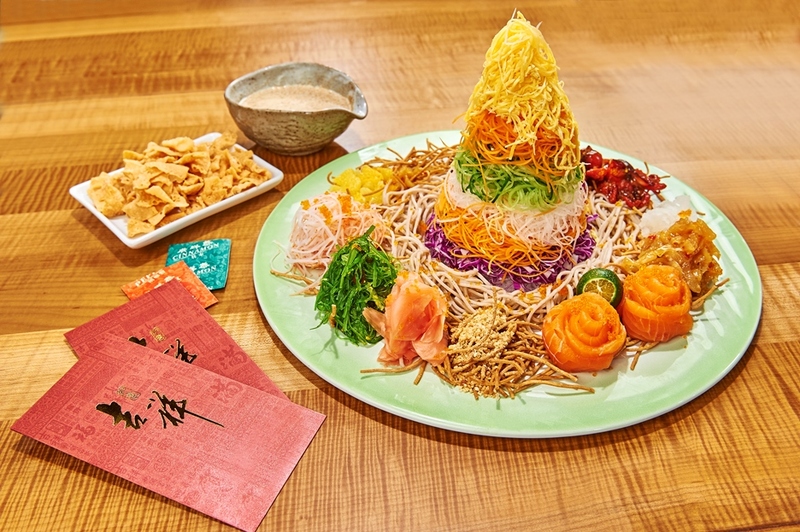 This Chinese New Year, toss to fortune, abundance and health with Greendot’s affordable vegetarian yusheng (S$28). For the first time ever, the brand has come up with a vegetarian yusheng — this delicious offering suits all palates and dietary requirements. It is made with konnyaku salmon slices, which replicate the look, texture and taste of the fish. It is also accompanied with soy bak kwa and pomelo - relish the invigorating interplay of savoury, sour and sweet notes. Homemade fruit-based sauce and vegetarian oil imbued with the fragrance of lemongrass is drizzled all over the yusheng for the final finishing touch. Plentyfull Blossom Yu Sheng is inspired by the flavours of South Thailand and North of Malaysia. With reminiscence of kerabu flavours, pineapple and Thai ginger dressing was used for refreshing and mix of flavours. This year, cured Yellowtail Hamachi is the ring that binds the delicious matrimony of flavors. Some vegetables used in this Yu Sheng includes Green Papaya, Beetroot, Watermelon Radish and topped with fried yam strips and micro cress. SENS is helmed by Chef Kent Seah, who has over 22 years of experience, trained in Japan and worked in various five-star hotels and restaurants. This year, SENS is launching a very colourful fruity yu sheng! 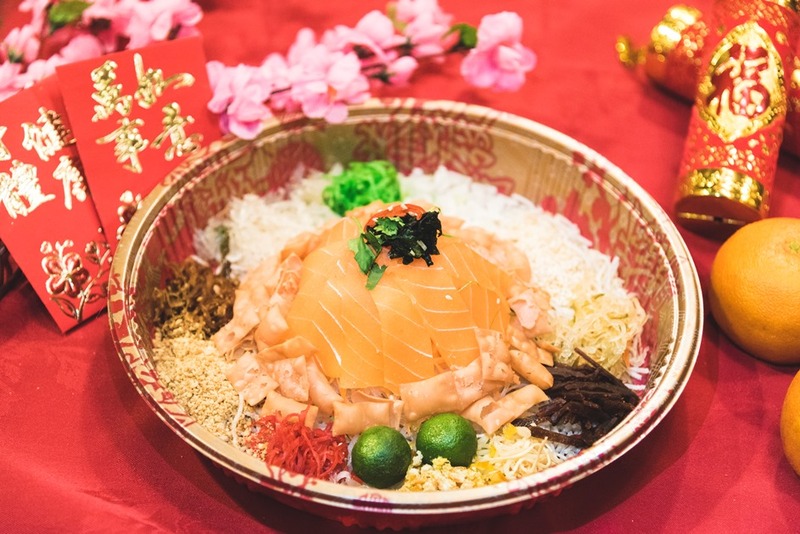 Bucking the trend of showcasing only vegetables, the Healthy Salmon and Fruit Yu Sheng (S$48, small) features up to 12 different types of fruits. Each fruit offers a refreshing bite and accompanying the fruits are thick slices of salmon sashimi. 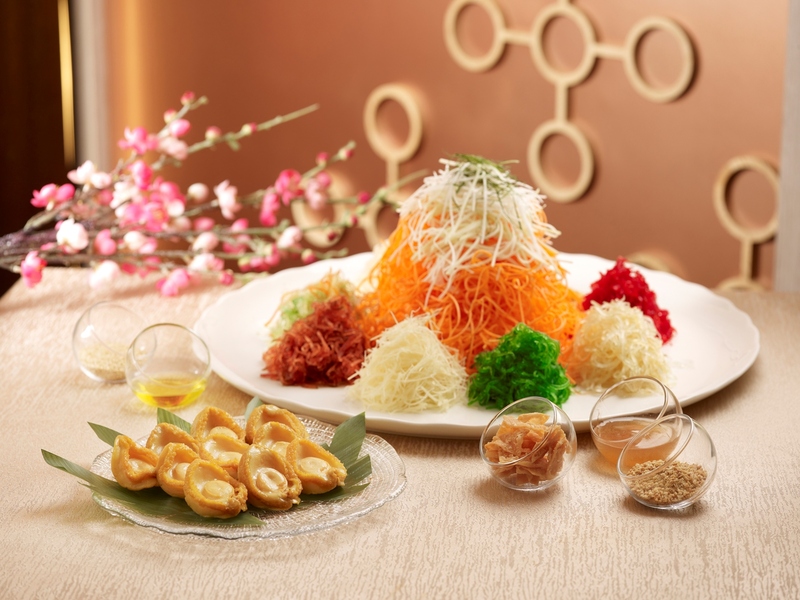 Also available is the Eight Happiness Gold Rush Yu Sheng (S$68, large). It stars the same 12 fruits as the marquee ingredients, and comes with added indulgence such as sword fish, ama ebi, Hokkaido scallop and salmon sashimi. The pairing of fruits with sashimi may seem a bit odd at first, but it is one that works remarkably well. Both the yu sheng are pulled together by a sweet homemade plum sauce by SENS. Olive oil is used instead of peanut or corn oil for a healthy spin. Five spice powder is not used in both yu sheng, allowing the ingredients¹ natural flavours to shine through. 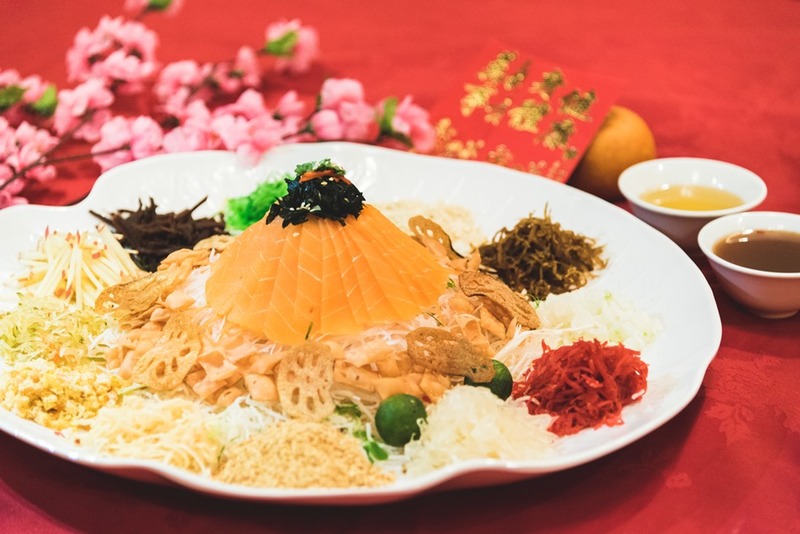 This yusheng is available from 15 January to 3 March 2018. Nadai Fujisoba Ni-hachi’s (Fujisoba), touted as Japan’s number one soba restaurant, is the first in Singapore to introduce yu sheng that comes with cold and fried soba noodles. This healthy and delicious yusheng caters up to 8 pax. It also features a generous medley of salmon, seasoned octopus, seaweed and jelly fish, crabstick strips, shredded egg and tobiko for a savoury note. 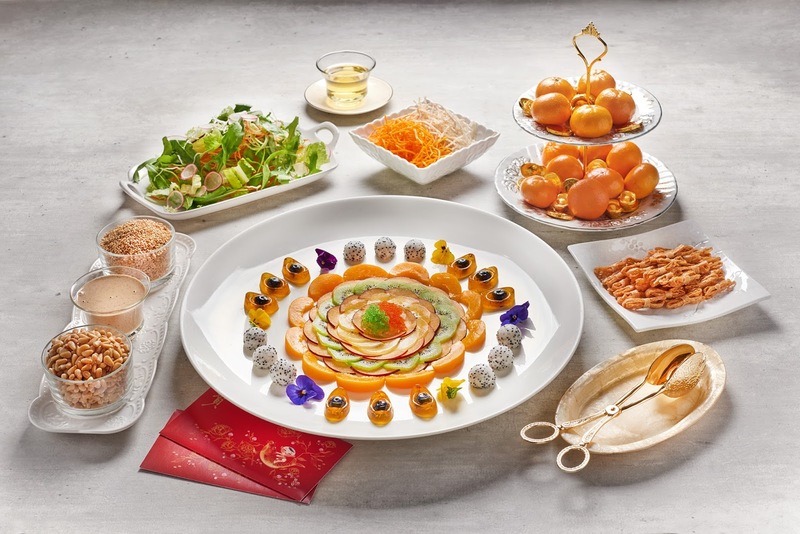 The sushi gari (ginger), orange cubes and winter melon strips offer a refreshing taste, while the white and red carrot, purple cabbage, Japanese cucumber and Chinese crackers a crunchy bite. A special sesame sauce pulls all the ingredients together. This will be available from 16 January to 28 February 2018. It will be a rewarding meal to remember with this exquisite creation by Master Chef Goh. Taking centrestage is a ‘flower’ with ‘petals’ that are made of julienned peaches, plums, kiwi and golden kiwi. Prettily perched in the middle is a mound of pomelo, wasabi tobiko and red tobiko. Encircling this beauty are nuggets of ingot-shaped osmanthus jelly studded with blueberries, as well as edible viola petals. Accompanying the main attraction are romaine lettuce, rocket leaves carrot, green radish, white radish, yellow frisee lettuce, snow pear, pine nuts, peanuts, sesame seeds, shredded fish ‘ribbons’ and two sauces – Japanese sesame and plum. This will be available from 29 January to 2 March 2018. Guests will be treated to double the luck as they ‘lo’ (toss) to greater fortunes while dining on this colourful platter by Master Chef Chan Hwan Kee of Min Jiang. 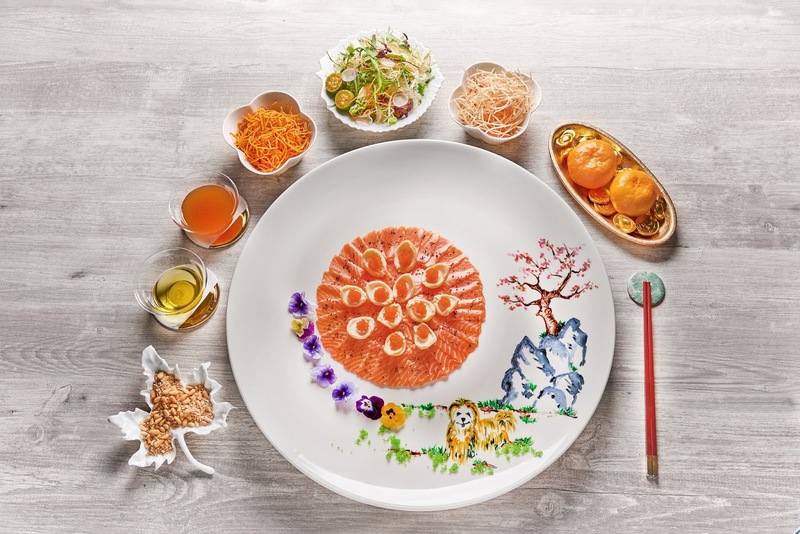 The eyes are first drawn to a beautiful Chinese painting on the plate – personally illustrated by Chef himself – of a friendly Pekingese perched on the foothills of a majestic mountain, and pretty cherry blossoms beckoning on the peak; then to the gorgeous sunset-hued arrangement made up of ultra-fresh raw salmon slices and abalones crowned with red tobiko. To complete the work of art, edible viola petals and wasabi tobiko lend a 3-D touch. A medley of crisp vegetables such as wild arugula, yellow frisee, red sorrel, red mustard greens, carrot, baby radish and white radish, pomelo, sesame seeds, pine nuts and crispy strips of fried sweet potato and yam are refreshing accompaniments, while the homemade dressing is a piquant mix of lime juice, lemongrass and plum sauce. This will be available from 29 January to 2 March 2018. Toss to good fortune with the restaurant’s signature Yu Sheng, a bestseller that comprises an appetising mix of interesting ingredients including smoked salmon slices, crispy vermicelli, fried sweet potato strips, preserved papaya, beetroot and shredded radish, complemented with a homemade dressing of plum sauce and pineapple paste. The Yu Sheng is available in two sizes, small portion at $98 for 4-6pax and large portion at $138 for 6-10pax. Additional accompaniment options include “Three-head quality” abalone ($60 per order), Bird’s nest ($60 per order), Japanese surf clams ($30 per order), Norwegian Salmon for dine-in only ($30 per order), Smoked salmon ($20 per order), Crispy fish skin ($16 per order), Crispy silver fish ($16 per order) and Crackers ($6 per order). Dine-ins are available from 1 Feb to 2 Mar 2018. 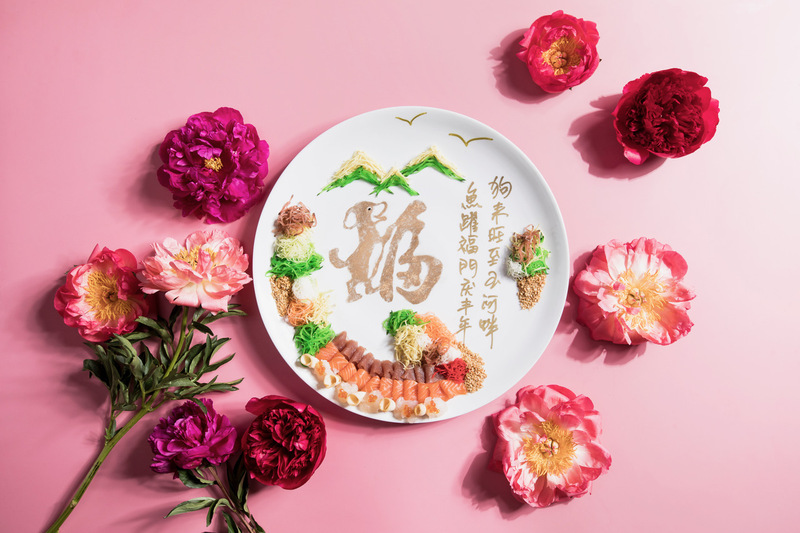 Toss and feast your way to prosperity and longevity with Peony Jade’s Instant Enormous Windfall, Good Health and Longevity” artistic Yu Sheng. This brilliant handcrafted work-of-art sets the tone for the festive feast as it is prepared with choice seafood namely, lobster from Canada, sliced premium 2-head golden abalone from Australia, Japanese Amberjack (hamachi) carpaccio, tuna (sashimi-grade), Norwegian salmon (sashimi-grade), pan-seared Hokkaido scallops, jelly fish, wakame, unami, crispy silver baits, topped with champagne jelly, French caviar, golden fish roes, lychee pops and edible 18k gold leaves. This celebratory toss-for-fortune must-have is complete with chef’s homemade recipe using fresh apricot and peach jam dressing, and Peony Jade’s deep-fried thin taro strips, roasted pine nuts and toasted sesame seeds. 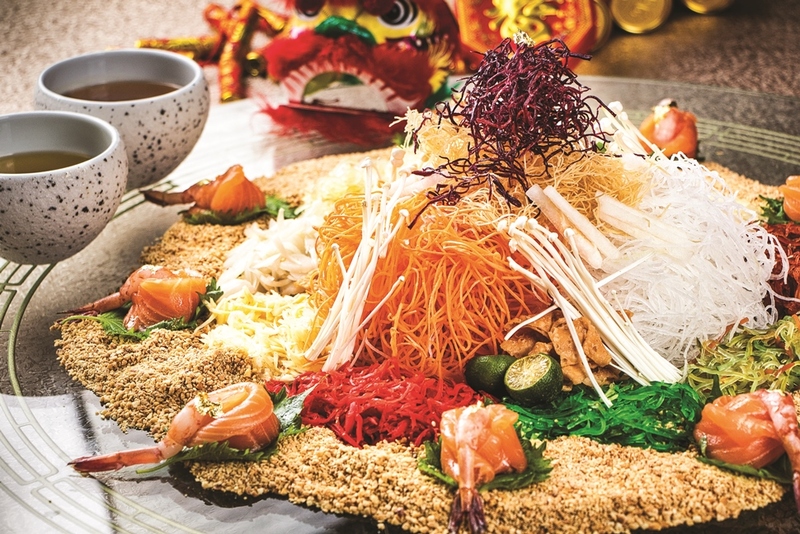 Priced at S$268.88++, this gluten free yusheng serves up to 10-12 guests, and is available for dine-in only at Peony Jade @ Keppel Club, and a 1-day advance order is required. All of Peony Jade’s Yu Sheng platters are available from 1 Feb to 2 Mar 2018. This coming Chinese New Year, Peach Blossoms presents the new, Japanese-inspired Amaebi, Salmon and Pear Yusheng. Apart from the usual yusheng ingredients, Bonito flakes are added for umami flavour, while for sweetness, fresh Japanese sweet prawn is added. Tobiko is included to give a semi-crunchy texture to the dish, and pear is thrown into the yusheng to provide the palate a refreshing taste. This Yu Sheng is available from 22 January 2018 to 2 March 2018. Location: Various locations, please refer to website. Toss to good health with the Dragon Bowl's Prosperity Abalone Yusheng with Fish Roe, which comprises Abalone, Lime, White Radish, Green Radish, Carrots, Cucumber, Capsicum, Pomelo, Pickled Ginger, Chinese Parsley, Peanut, Five Spice Powder, Cracker, Plum Sauce, Oil, all pulled together by the Yusheng Sauce. This year, Paradise Group serves Prosperity Abalone Yu Sheng across their branches. The Yusheng ingredients are freshly grated at respective restaurants, while condiments are prepared daily at Paradise Group’s very own central kitchen to ensure consistency in taste and quality. The team has paid great attention to details of the packaging - not only it is presentable, it is effective and convenient too. For the specialty Yushengs at Taste Paradise, Paradise Teochew and Seafood Paradise, the ingredients and condiments are prepared by the in-house chefs of the respective outlets. All their Yu sheng platters are available from 26 January to 4 March 2018.